The Granite Mountain Hot Shots were a group of a highly-trained, elite crew of firefighters who, when they weren’t palling around, sippin’ on cold ones, and trying to make ends meet, they were saving cities from wildfires. However, it wasn’t always fun, games, or hell, even all that pretty. For awhile, the guys weren’t certified and doing their best to not just be respected, but actually accepted in a world where firefighters, despite saving lives and, in this case, whole tons, weren’t looked at as “heroes”, or even “saviors”. They were just a bunch of bros, who brought a bunch of water, and put out the fires. But in this case, it was much different. For instance, there’s Eric Marsh (Josh Brolin), or as they call him, “Supe”, who handles everything, when he isn’t handling his marriage-relations. Then, there’s Donut (Miles Teller) a junkie who’s causing all sorts of trouble, until he soon realizes that it’s time to get his act together, just in time for his baby to be born, by an ex that wants absolutely nothing to do with him. Of course, the fellas get certified and while it’s a heroic and momentous landmark for them to achieve, come 2013, it doesn’t quite work out too well. Only the Brave is the kind of hokey, silly, and ridiculously entertaining piece of mainstream entertainment that can, at times, feel like a Budweiser commercial. It’s got big trucks, big men, big beers, big parties, big fires, big, loud music, and oh yeah, hot women. All that’s missing are the constant shots of these men’s tight, round-butts in a nice pair of jeans, although, while I think about it, I think there may have been one or two. It’s the kind of movie that praises and sends out a tribute to those old-fashioned, blue-collar lives that, in all honesty, each and everyone of us want and this movie, in all its shining and patriotic glory, doesn’t help to cease. And you know what? There’s no problem with that. 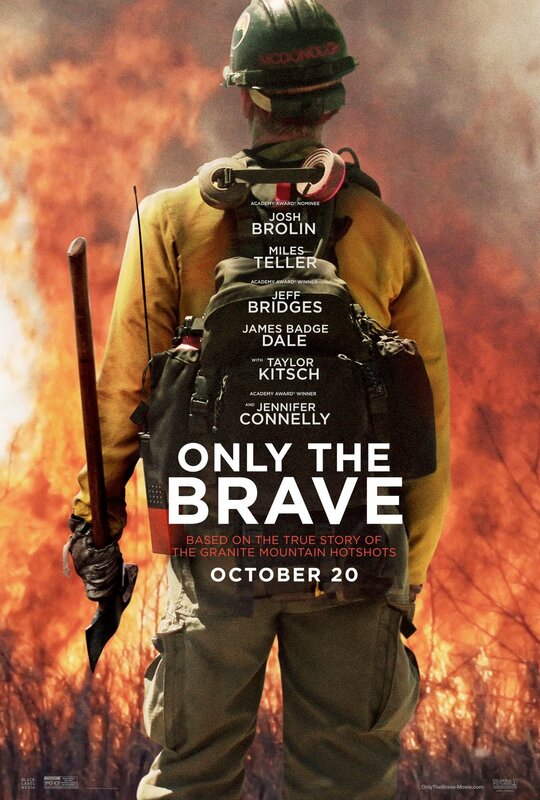 Sure, Only the Brave could have been the kind of movie that makes each and everyone of these men out to be heroes, through and through, with no issues, or conflicts in life, other than whether or not they’re going to bag the hottest chick at the bar, or if they’re going to be able to stop that fire before everybody else. There’s nothing wrong with that if the movie did do this, because after all, it’s based off of real people and all too-real disastrous event that ended-up taking most of their lives, but Only the Brave is a tad smarter than that. It shows us that, beyond all the machismo and ripped-jeans, they were real people who, like you or me, had issues with money, with relationships, with family, and especially with trying to stay alive for those who depend off of them. Director Joseph Kosinski and co-writers Ken Nolan and Eric Warren Singer never seem to lose sight of the humans in the center of all the madness and carnage that, even when it does seem to be praising these guys for every little thing they do, it sort of doesn’t matter. The movie’s already done a fine enough job of getting us to fall in love with their simplistic, Americana ways that we already hooked in to whatever happens to them. And because of that, we not only grow to love each and everyone of them, but the atmosphere in which they live and exist, making it seem like all too-ideal of a life to live, but one that looks almost too desirable not to be real. And it is. That’s why we love and praise firefighters so much, because deep down inside, we secretly want those jobs. They’re simple, but not all easy and Only the Brave doesn’t forget about that aspect, either. But because it has such a great ensemble here, with Brolin, Teller, Jennifer Connelly, Jeff Bridges, and surprisingly, Taylor Kitsch, all turning in excellent performances, that we almost forget about the real danger lurking somewhere out there in the distant. It’s a reality that the movie alludes to every now and then, but due to it being involved with these guys’ lives, it we forget about it – it’s definitely done so on-purpose and you’ve got to chalk it up to the film-makers for not relying too much on the fires themselves and much more so on the actual humans in the center. After all, they’re the hear and soul of this tale, as well as they should be. Cause if it wasn’t the Granite Mountain Hot Shots, it would have been other hopeful, ambitious guys who wanted a better life for themselves, their family, friends, and people they don’t even know. They’re just doing the jobs that most of us will knock off as “too simple”, or “too blue-collar”, but in reality, therein lies the problem. It’s much more than that and hell, we shouldn’t forget. Consensus: As cheesy as it can sometimes get, Only the Brave is still an entertaining, thoughtful, and incredibly well-acted tribute to the real lives lost, as well as the countless others who fight to save ours, day in and day out.